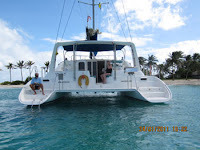 Bill and Ali, owner-operators of the charter yacht Nauticat of Fowey, announce that they will be staying in the Virgin Islands this summer and are available for charter through August 14 (2011). 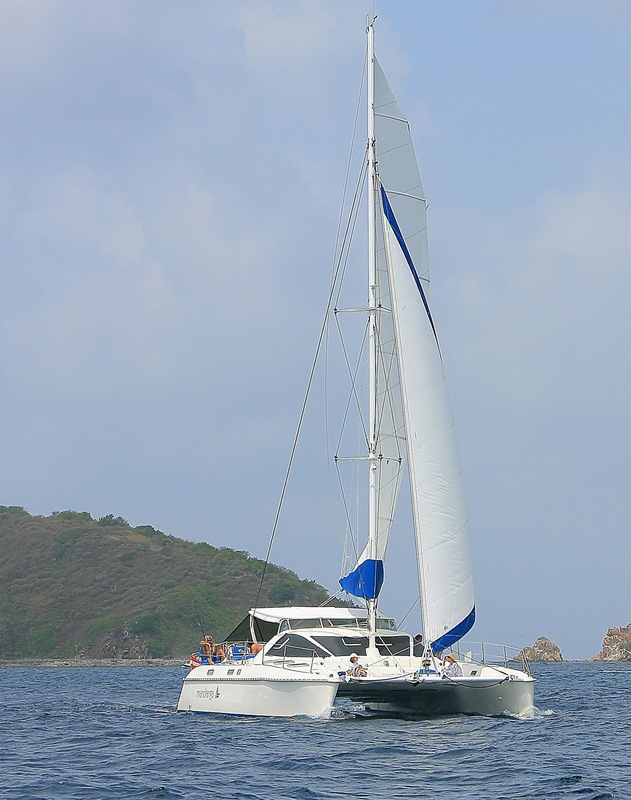 Nauticat of Fowey is a a 47-foot Leopard catamaran with a crew of two (owner-operators). Nauticat is fully air conditioned and accommodates up to 6 guests in 3 cabins, each with Queen berth and ensuite head/shower. Nauticat has a 12-foot dinghy with 25HP motor, tube, 2-person kayak, snorkel gear, TV/DVD in salon, portable DVD player, iPod, Kindle with many eBooks, etc. Looking forward to your inquiries ! 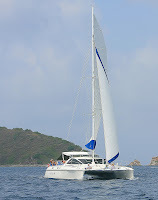 The catamaran MAROLANGA is available for yacht charters throughout the summer in the Virgin Islands (either the Spanish VIs or US/British VIs). Quite often we have people asking if their kids will be bored... NO WAY!!! They were great and made the vacation especially memorable. 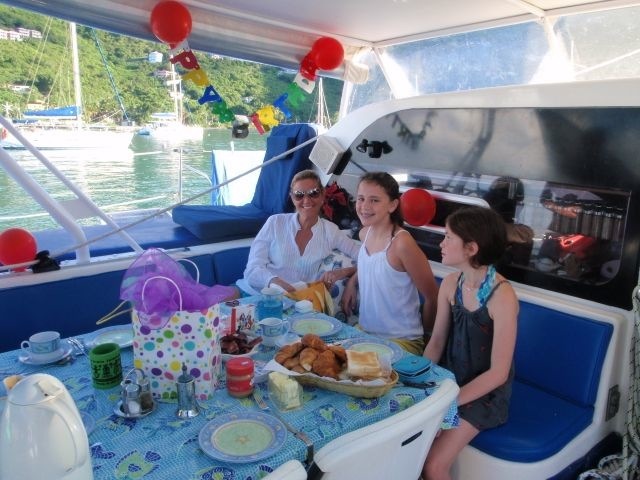 How would you describe the quality and presentation of the meals served on board ? Unbelievable. Barbara prepared seven perfect dinners. I am serious when I say that all seven of her meals would make the top ten list of my life. It was amazing, from choice of food, preparation, timing, presentation, freshness, taste, temperature, it couldn't have been better. 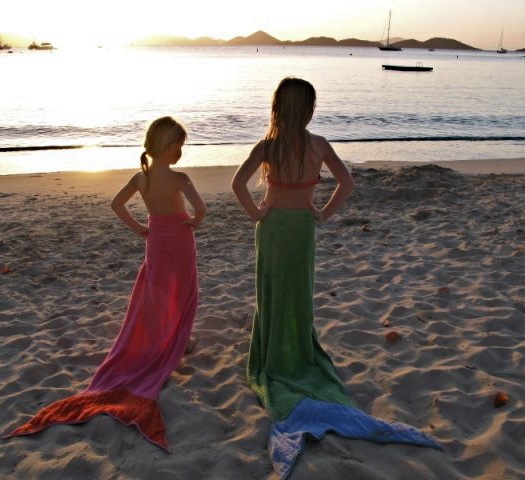 How did you find the services offered by Paradise Connections ? 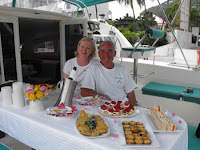 You made chartering a boat very easy, and responded promptly to all my questions. Again we had a wonderful time. Thanks to all. We are going to have some exciting news from Wayne & Barb... Stay tuned! Great news! JetBlue airlines will begin flying to the U.S. Virgin Islands this winter, both St. Thomas and St. Croix. Beginning December 15, 2011, Jet Blue will be adding two daily round-trip flights to St. Thomas (STT) and one to St. Croix (STX) from San Juan, Puerto Rico. 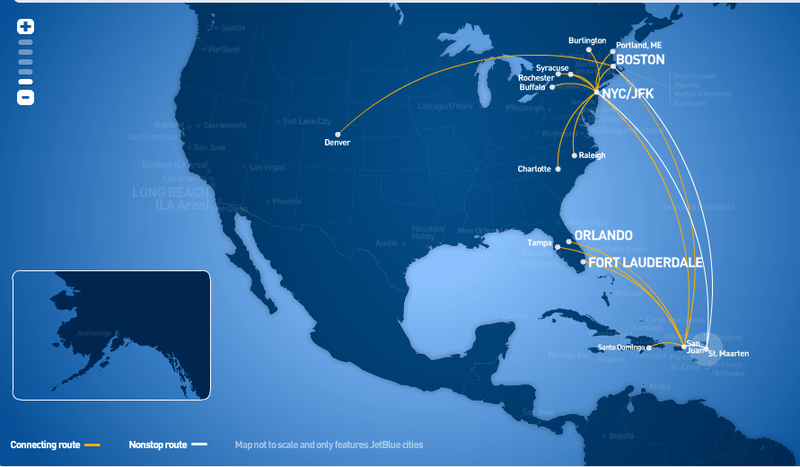 JetBlue also plans to connect Boston to St. Thomas, saying it plans to a fly five nonstop flights a week on the southbound portion of the route. The northbound St. Thomas to Boston service will operate with a stop in San Juan. This Boston service will be seasonal, operating only during the winter schedule. 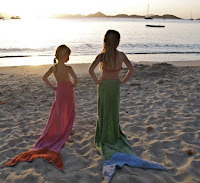 Other Caribbean charter destinations that Jet Blue serves is St Maarten (SXM) and for those of you sailing in the Grenadines, Jet Blue flies into Barbados. Not the Caribbean, although many people put it in that category, JetBlue flies into the Bahamas (Nassau - NAS) and the Turks & Caicos Islands (PLS). 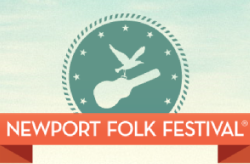 MUSIC LOVERS: Combine the Newport Folk Festival (July 30 & 31, 2011) with a Yacht Charter and perhaps the Newport Jazz Festival the following weekend, too! 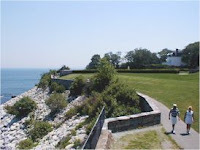 The venue for this event is Fort Adams, situated at the mouth of Newport Harbor with panoramic views of the Newport Bridge and the East Passage. The festival at the Fort features three stages of music, food & crafts, and a number of displays. We have a large selection of yachts (motor & sail) with a wide range of pricing & amenities available. 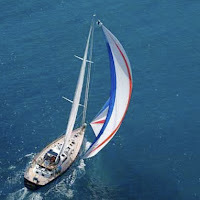 Here's a sample 4-day sailing itinerary that would nicely round off your week. 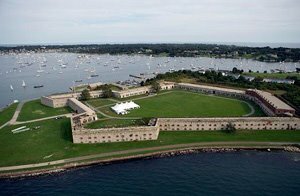 Or, how does this sound for you music buffs: Do the Newport Folk festival, go do a bit of sailing, then come back for the Newport Jazz festival on August 5, 6 and 7! This works for me... how about you? Wouldn't this be an excellent week ???? 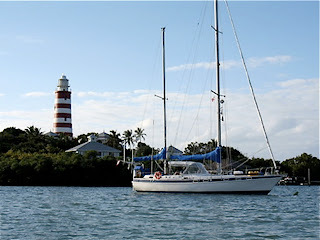 The charter yacht Dream Ketcher, a 41-foot Morgan Out Island ketch, is chartering in the Abaco islands of the Bahamas and offers onboard diving with budget and family-friendly pricing. 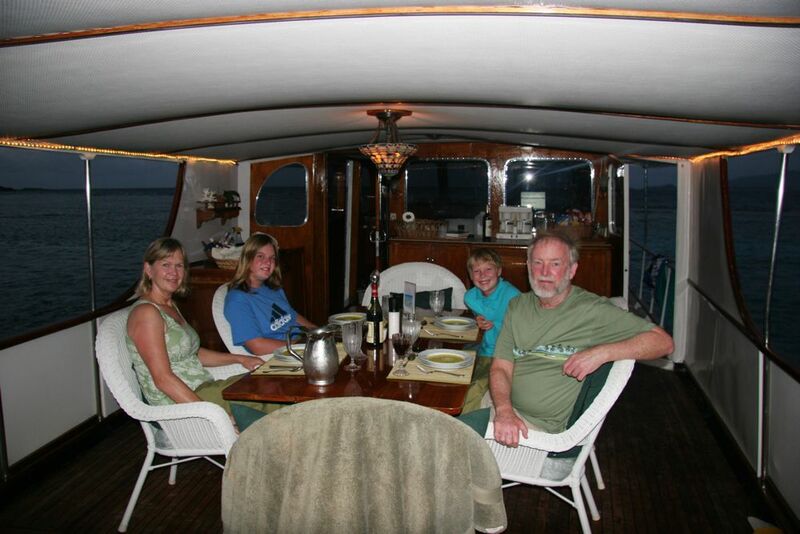 Dream Ketcher has a crew of two and accommodates up to 4 guests for a family charter. 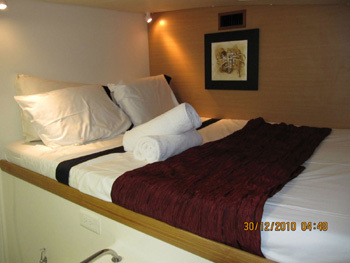 The forward guest cabin is a large V-berth and has ensuite private head with toilet & shower. 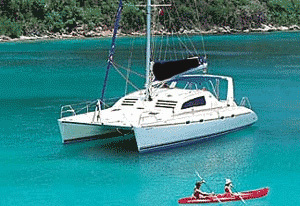 There is a quarter berth after (port side) which is suitable for a young adult/teenager or two young children. The quarter berth can be curtained off for privacy. 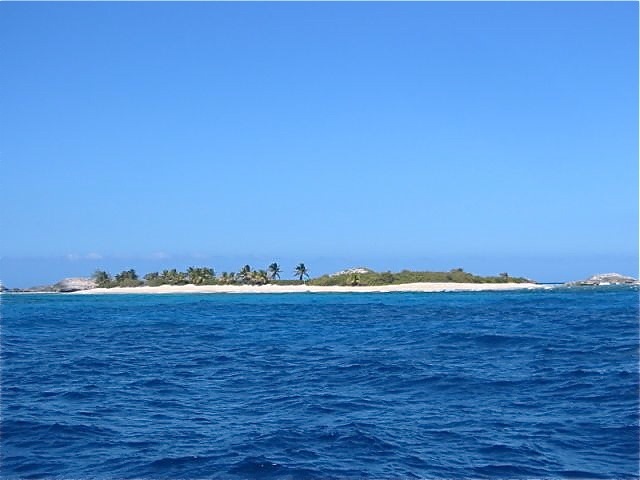 Eric and Nathalie have spent the last couple of years learning all the best spots in the Abaco's and Nathalie has logged over 150 local dives. She and Eric look forward to sharing their local knowledge with guests and showing them the secret harbors, beautiful cays and the abundant underwater life of the glorious Abaco Islands. Both Eric and Nathalie have traveled extensively in their previous professional careers promoting international sporting events and are delightful, well educated, engaging and between them speak French, English and Spanish. Nathalie's cuisine is influenced by her home country of France with a variety of Caribbean and fresh seafood dishes sure to please any palate. 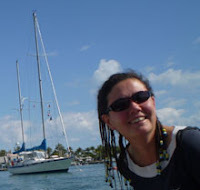 As PADI Dive Instructor, Nathalie is eager to show anyone the wonders below the surface. 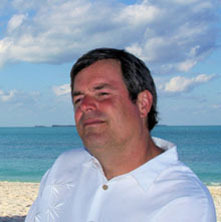 Eric, a licensed Canadian sailing instructor, is delighted to share his knowledge and instruct guests in the art of sailing. Take advantage of Dream Ketcher's introductory rates. Prices are All Inclusive (except bar). 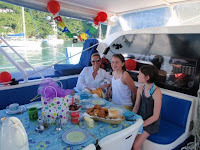 This includes: all meals, snacks, and beverages (non alcoholic) aboard the yacht, Bahamian tax, cruising permit, fees and diving. See bar options, below. UPDATE: January 2013:Dream Ketcher offers 3 bar packages for you to choose from. Select wines & beverages from the list and make your own package. 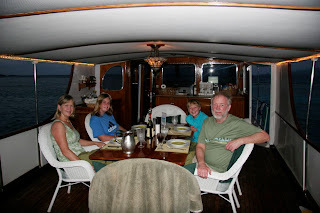 This French crew has an excellent knowledge and taste in wines - CLICK HERE for wine list. Nathalie is a PADI Dive Instructor and Dream Ketcher offers up to 6 dives/week for certified divers. Bring your own gear or rent BC/regulators. 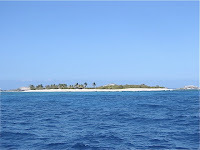 They also offer a resort course ($150/person) for non-certified divers. Inquire for other instruction.